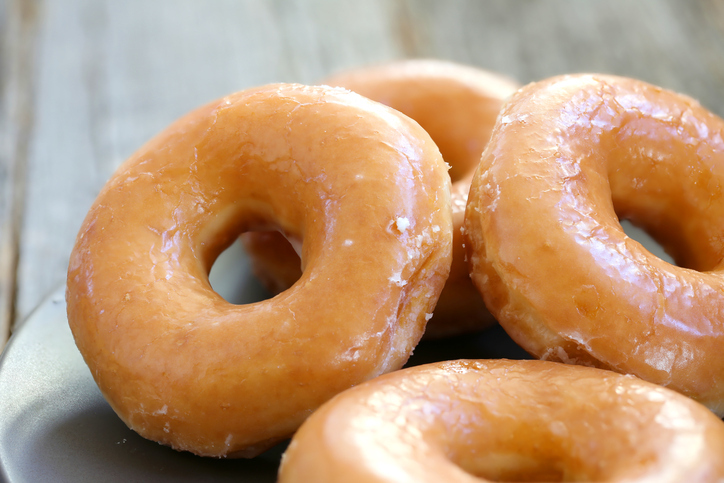 To glaze means ‘to become glassy in appearance’, like eyes might do. It’s also ‘to furnish or fit with glass’ and ‘to give a glassy surface or coating to something, as by the application of a substance or by heating.’ If the thing we’re coating is food, then glaze means ‘to coat with a liquid substance that sets to form a smooth, glossy surface.’ As a noun, a glaze is both a smooth, glossy surface and the substance poured to get such a coating. In food, glaze is a substance, usually a sugary syrup. The students' eyes glazed as the teacher droned on. The potter glazed the bowl. The glaze on this vase is beautiful. The glaze was carefully applied to the plates. Tania made a honey glaze for her cake. In meteorology, glaze or glaze ice is a thin coating of ice caused when rain freezes immediately upon hitting a surface. You can read more about glaze ice here. Glaze dates back to the mid-14th century. It evolved as a variant of the Middle English verb glasen, which meant ‘to fit with glass’ or ‘to make shine.’ This verb, in turn, came from the Middle English noun glas (glass), which can be traced back to the Old English glæs (glass or a glass vessel), from the Proto-Germanic glasam and the Proto-Indo-European root ghel– (to shine). Glass and glaze are related to the Old Saxon glas, the Middle Dutch and Dutch glas, the German Glas, the Danish glar (all meaning glass), and the Old Norse gler (glass or looking glass), as well as the Greek khloros (greenish-yellow color), the Latin helvus (yellowish, bay), and galbus (greenish-yellow), the Old Church Slavonic zlutu, the Polish żółty and the Russian zeltyj (yellow), the Old English geolu or geolwe, the German gelb and the Old Norse gulr (yellow), the Old English gold and Gothic gulþ (gold), and of course many English words, including chloride, cholera, cholesterol, gild, glad, glance, glare, gleam, glee, glimmer, glimpse, glitter, gloss, gold, melancholy and yellow. The sense ‘to cover with a shiny substance,’ which is the most common meaning now, first appeared around the year 1400. The noun, meaning a substance used to make a glossy coating,’ dates back to the late 18th century, and comes from the verb. The meteorology sense, for a thin coat of ice, is a bit older, as it was first used in the mid-18th century.